SANA'A, YEMEN, YEMEN - APRIL 30, 2017 A billboard of a Houthi rebel stands in the outskirts of Sana’a. 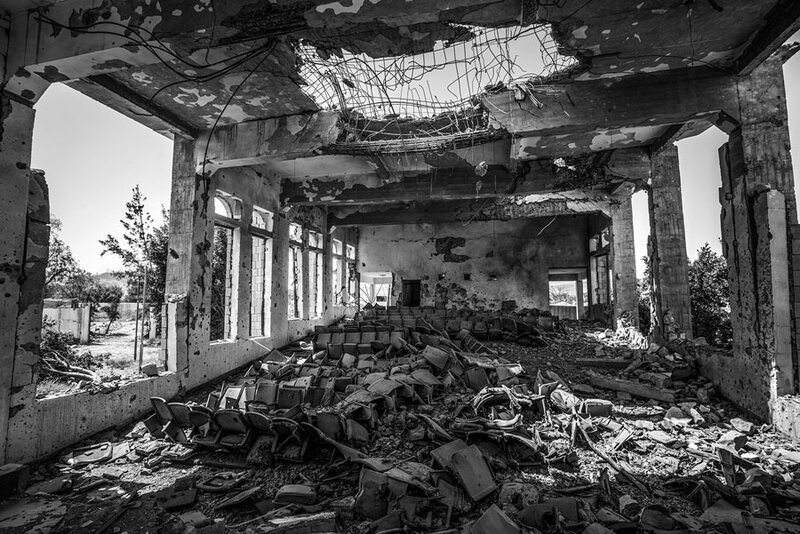 SAADA CITY, SAADA GOVERNORATE, YEMEN - APRIL 24, 2017 The former Assembly Hall of the Governor of Saada lies in ruins following multiple airstrikes in April 2015. AL THAWRA HOSPITAL, SANA'A. YEMEN - APRIL 29, 2017 An injured pro-Houthi soldier photographed on his hospital bed. 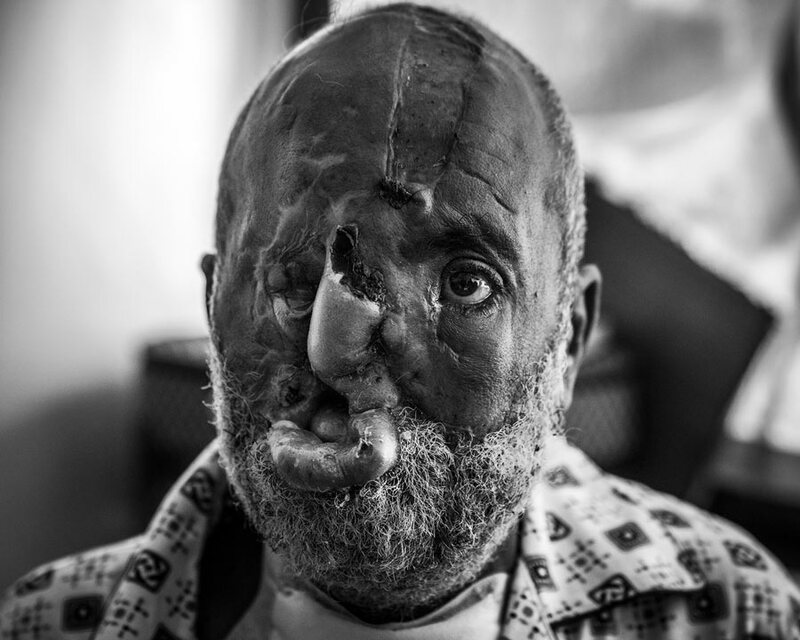 His disfiguring facial wounds occurred during an airstrike in the northern Saada region some five hours north of the Yemeni capital. 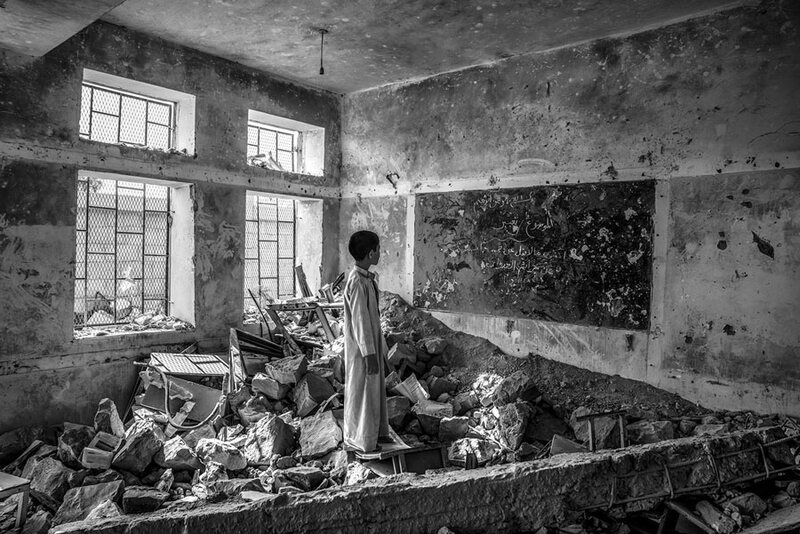 AAL OKAB SCHOOL , SAADA CITY, YEMEN - APRIL 25, 2017 A student at the Aal Okab school stands in the ruins of one of his former classrooms, which was destroyed during the conflict in June 2015. Over 1700 schools have been closed since the conflict began in 2015, with some 2 million children now not receiving a formal education. 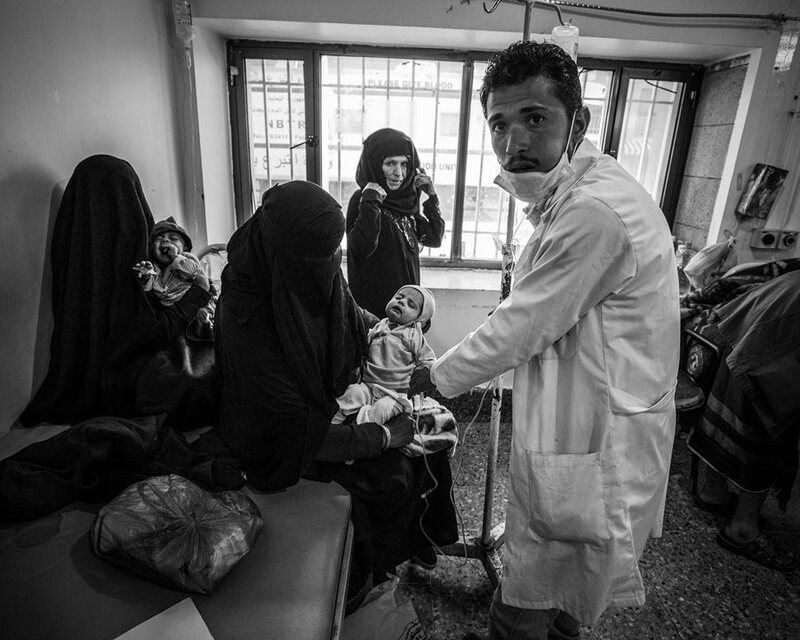 AS-SABAEEN HOSPITAL, SANAA, YEMEN - APRIL 13, 2017 A Yemeni doctor contends with a growing number of infants stricken with severe malnutrition. There were over 500,000 reported cases in 2017 with an infant dying every 10 minutes according to latest UNICEF reports. AL JOUMHOURI HOSPITAL, SAADA CITY, YEMEN - APRIL 24, 2017 Batool Ali, aged 6, crouches on a hospital bed suffering from severe acute malnutrition. At the time, Batool weighed only 15.8 kgs and only able to ingest liquids. The small pouch attached to her right arm is a local rural potion wrapped in a bag and used to ward off snakes whilst families take overnight shelter in homemade holes in the desert. During the night, many families leave their houses for the desert shelters in fear of airstrikes on their homes. In early July 2017, some 6 weeks after this photograph was taken, Batool passed away from complications due to cholera. AL THAWRA HOSPITAL, SANA'A. 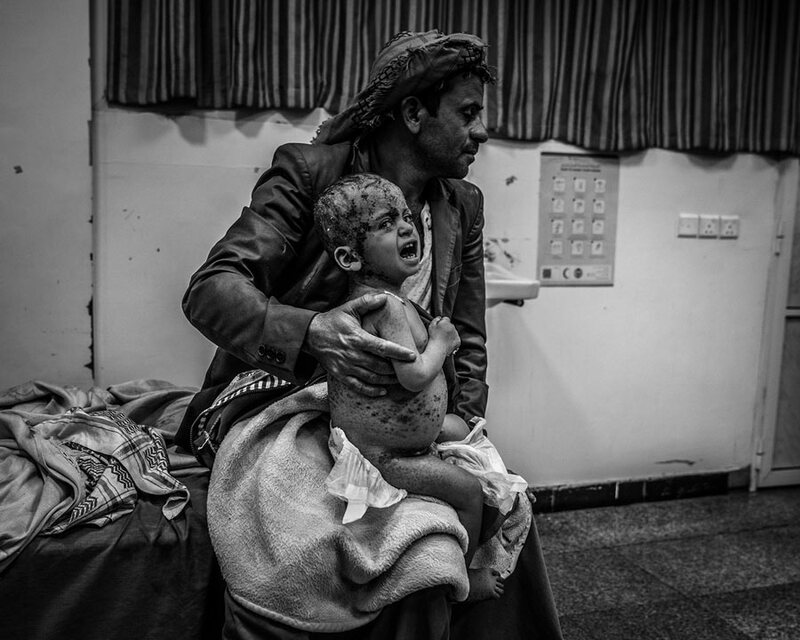 YEMEN - APRIL 29, 2017 A father with his badly injured child await treatment having traveled a full day from a remote region in the north of the country. 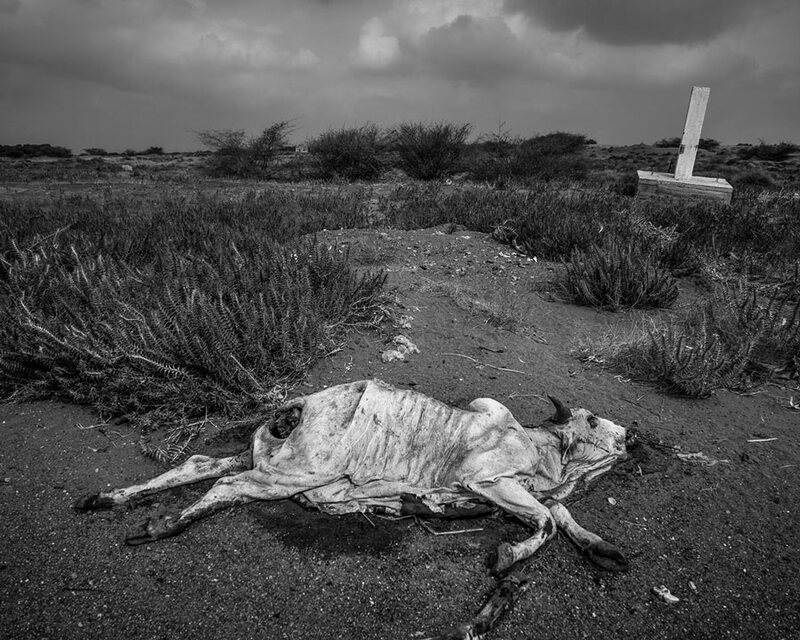 AL HUDAYDAH, YEMEN - APRIL 19, 2017 A dead cow lies beside the main road leading out of the port town of Al Hudaydah. Locals tend to avoid dead carcasses as some have been known to be filled with Improvised Explosive Devices (IED). KHAMIR IDP SETTLEMENT, KHAMIR, YEMEN - MAY 06, 2017 A displaced woman drags water back to her tent. Since the restrictions on imports of fuel which is critical for maintaining the imported water supply. According to UN agencies. some 15.5 million people now lack access to safe drinking water or sanitation, including 8.2 million who are in acute need. 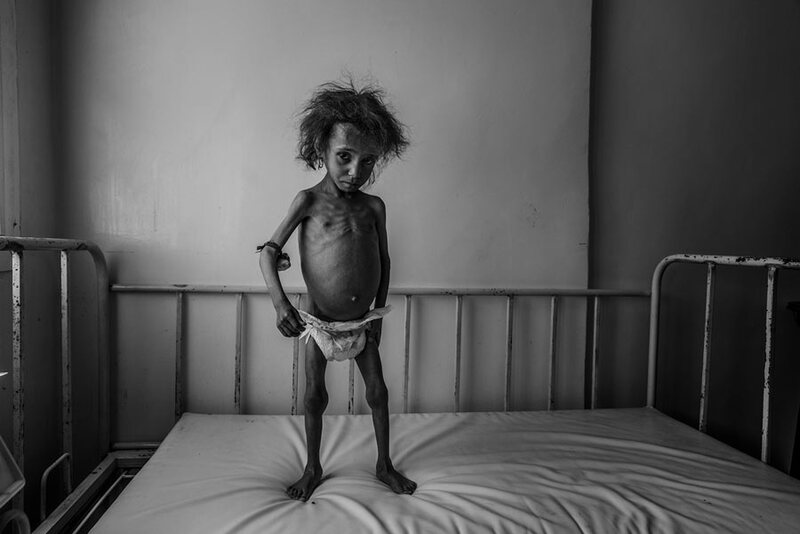 After almost 4 years of relentless conflict, Yemen now faces an unprecedented humanitarian crisis that has rapidly engulfed the majority of the population of the Middle East’s poorest nation.With the ongoing Iranian-backed Houthi rebel and Saudi-led coalition conflict already raging, there are also lawless Al-Qaeda and ISIL-held regions that have left the Middle East’s poorest nation badly wounded and in a state of deep turmoil. 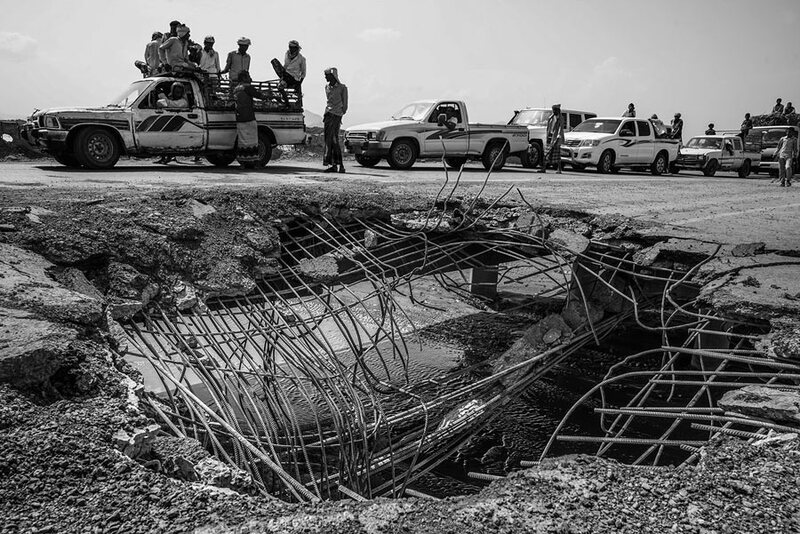 According to the latest United Nations reports published in April 2018, an alarming 20.8 million people – almost two thirds of the population – need humanitarian assistance or protection support. ‘Yemen: Proxy War Turmoil’ was created in mid-2017 in the Houthi-held region of northern Yemen; a place now off-limits to outsiders bar a somewhat skeletal United Nations agency presence. 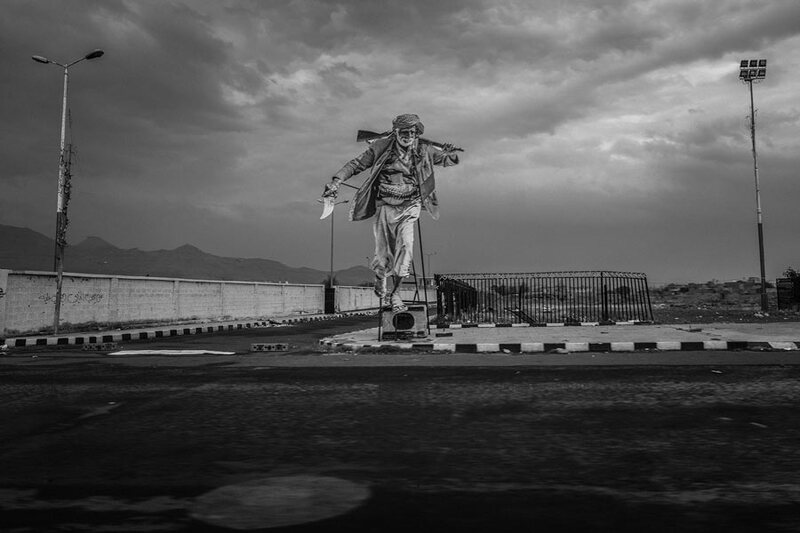 Since mid-2015, when Houthi rebel forces took over the capital city of Sana’a, at least 3.5 million people have fled their homes from regions now embroiled in a prolonged ground war. As a result of the fighting, public services and the nationwide infrastructure have broken down. Less than half of the health centers function with medical supplies at a critically low supply. Doctors and public health workers have not been paid since late 2016 but continue to work despite the increasingly bleak future. This is a country now deeply fractured by war and, unless there is some kind of peace agreement sometime soon, it seems very likely that the already desperate situation will plunge further into the abyss. Should I be awarded, I will return to Aden in Yemen but wary that access has become increasingly difficult. My project will therefore likely continue first in Djibouti which is just a short journey over the Red Sea from Aden. 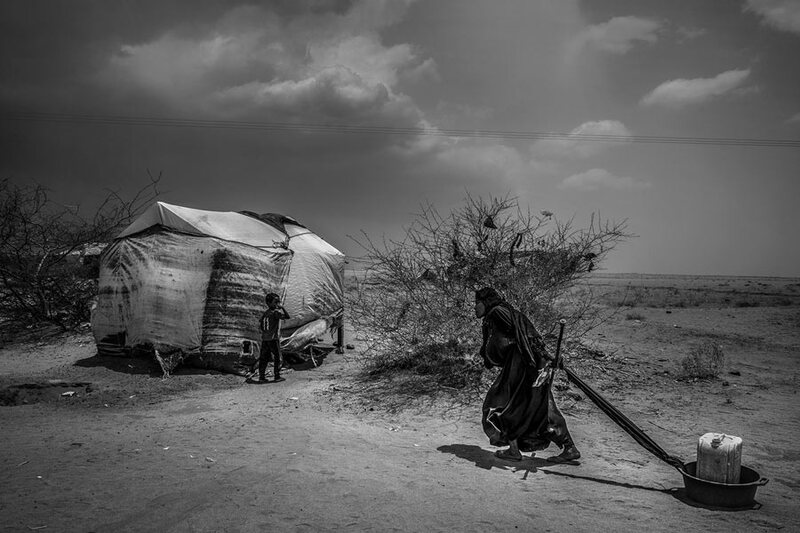 There I will document the growing number of migrants and Yemeni refugees who fled Yemen and now reside in tent cities in the rugged Djibouti desert. There are now 40,000 displaced Yemenis in Djibouti, some of whom have been given a temporary work visa status, but with many still arriving, the tensions have begun to rise. How do these transient communities operate now and what are the hopes of those now displaced? I will also focus on covering the rising influx of Somali, Sudanese and Ethiopian migrants who are arriving from their respective lands looking for continued passage to Yemen then onward to Oman, the United Arab Emirates and beyond. Some 100,000 made the difficult journey across the Red Sea in 2016 aided primarily by smuggling networks now operating in Djibouti, Somaliland and Somalia. This number has fallen in recent months as the coalition sea blockades have increased. The unrelenting pressure transgresses far beyond the borders of a country already embroiled in a bloated humanitarian crisis.